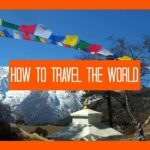 You are here: Home / How to Get Money to Travel. How to Afford Travel / Family Budget Travel. Top Tips to Cut Travel Costs. Get out there and live a little! 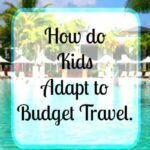 Be with your kids, see the world, and do it the budget way! Family World Budget Travel is possible. In our first year on the road we weren’t just about family budget travel, we were rocking extreme budget travel. 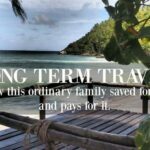 Our budget for Asia on on our first year of full-time family travel was crazy-low, it hovered between $40 and $50 per day. That’s not much for a family of four and it’s certainly a lot less than we’d spend living at home. We had a brilliant time, so how did we managing to travel so cheap? I’ll share some of our tips, strategies and ideas for family budget travel with you today. We used them, it worked, we’ve proved it. You can do it too should you be as crazy as us. 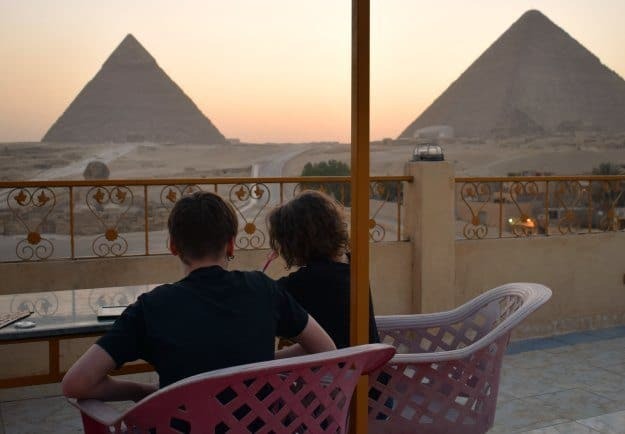 I’ll say now that we no longer travel this cheap very often, we have more money coming in so we splurge and indulge, but when you have $30,000 and you want to make it last as long as possible, this is how you can stretch your cash. I used to keep catching myself doing things that most people would consider ridiculous. Like buying a baguette and a bar of chocolate instead of the expensive pain au chocolate from the French bakery over the road. Or taking half-empty complimentary shampoo miniatures, toilet rolls and soaps to our next destination. The next guest house may not have them. Little things save a few cents and add up, but that’s only part of the story. It’s about finding a comfort to cost ratio that works for you. You need to be happy with what you’re doing and enjoy your trip. You can save money on the things that aren’t important to you, we all have different priorities. Which of these things do you want from your travel experience? To See the Country and the Culture without the Tourist Draws. I could go on. Know yourself and the rest of your family. Know where you need to spend and where you need to economise. Pick the places and things that you absolutely HAVE to do and see. You don’t have to see them all. Find the right places to eat. Find YOUR way of making your trip fun and enjoyable on YOUR budget. We’re all different so I can’t tell you what to spend and on what. We don’t compromise on safety, ever. If we feel the night bus is unsafe, we take the train. If the train with open windows will be full of Dengue-carrying mosquitoes, we book berths with air-con. I mostly don’t take the kids on the back of a moped if I have any traffic concerns, I’ll pay for a taxi or songtaw instead. We don’t compromise the children’s diet. Eat well and stay well. I cut back on my own food, I’m happy to lose weight. We don’t go without travel insurance. We’ve had enough accidents to realise that children are totally unpredictable and liable to injure themselves in unexpected ways. ( My husband just had emergency surgery in Thailand, the insurance covered the $7.5K) . We don’t go without important travel vaccinations, but we do shop around. World Travel Family Budget Disclaimer. I feel I need to put a bit of a disclaimer in here, I don’t want families setting out thinking they’ll get by on our budget easily. Our travel budget above does not include the cost of the initial flights, vaccinations, gear or insurance. Those things are covered before you leave home s come out of your lump sum before departure. We only include ongoing and daily costs on the road. This sort of family budget travel would not be possible everywhere, but it worked for us in Asia. We travel long-term and we travel fairly slow. We aren’t rushing about trying to see all the sights of South-East Asia. We’ve travelled around this part of the world several times before, so we’re not too bothered if we “miss” anything because of costs. We’re often more about living our life in amazing locations than holiday or sight-seeing. If we go over budget, it doesn’t matter, we have money in reserve. Sometimes we splurge and go over budget, particularly on wine or cocktails, that’s OK by us. Our total spend for year 1, after UK, USA and a cruise, came in at just under $100 per day. A big part of that was new computers and cameras. We think we’re pretty good at family budget travel after so much practice, so here are a few ideas from us to you. Best Blog Read Now! Is Cruising Safe For Kids? Yes it’s budget accommodation, yes it has a million dollar view. Cheap doesn’t mean bad. SE Asia and Eastern Europe are generally cheap. South and Central America cost a little more. The UK, Western Europe and Australia will hurt your pocket. Spend more time in the cheap places, less in the expensive. Don’t forget that there will be variations within countries too, Bangkok costs more than Chiang Mai for example. All of these things will have a marked affect on prices and crowds. Chck out local variations and holidays. If you’re concerned about ideal weather conditions the “shoulder seasons” are often the best times to travel, for ultra budget, visit in the low season. For travellers like us, weather often isn’t a big concern. If you want to catch a big festival be prepared for higher prices on accommodation and flights. Find The Cheapest Flight You Can. You need to be flexible with dates and departure points and avoid peak periods. to find your best day, best destination and best airline, at a glance. Midweek is often cheaper, but not always, Skyscanner will give you a chart. The “golden period” for booking is said to be 3 months before departure. 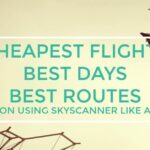 I’ve put together a separate post on using Skyscanner to find the best bargains. Once we’ve seen a bargain flight we often book direct with the airline, it can be a few dollars less. Sometimes it works out cheaper to fly from an airport other than your local one. We usually make the trek to Brisbane or the Gold Coast by car rather than paying the extra to fly out of Cairns. Air Asia is a fantastic budget airline that only uses certain smaller airports to save you money on taxes. Start researching flight prices as far ahead as possible. Signing up for email notifications of daily flight price fluctuations is a good idea ( Skyscanner will let you do this). Book when prices dip. Prices rise toward departure. Subscribe by email to all your favourite budget airlines. You will be first to know of future fare sales. Walking and enjoying nature should always be free. 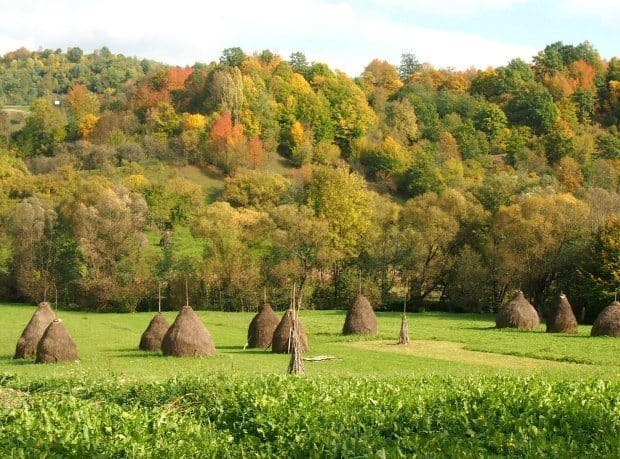 Romania, our adoped home. Maximise on free fun and search Google for “Free things to do in…” Look out for walks, parks, playgrounds, museums and natural beauty spots as well as on foot explorations and free walking tours of towns and cities. Sometimes we book in advance in Asia, when we’re fed up of the hassle of finding accommodation on arrival. Generally you will find it more cost-effective to turn up on multiple doorsteps and negotiate prices. The longer you stay in one place, the better the rates, try putting a longer stay into the online booking form and see if the rate drops, also use this as a negotiating tool face-to-face. Accommodation costs fall in the off-season. We’ve had better results when booking in person if we send my husband to find a room for us alone. It’s easier on the kids and the sight of a hot, tired family sometimes puts prices up. If you book in advance, on the internet, you may run into maximum room occupancy restrictions . Our kids are small so we can all share a twin or double room if the beds are a decent size. Look out for kids stay free if using existing bedding deals.Some hotels consider children as young as 5 to be adults and will insist on an expensive extra bed for them. Other places will allow kids up to 12 years old to stay for free. Check the small print. Best Blog Read Now! Thailand With Kids. No Worries! We’ve found that Agoda and Booking.com are the easiest accommodation agents to use for budget family accommodation. We have found that hostels and hostel booking websites don’t work well for families, here you will be paying for 4 adult beds, no child discount. Hotels and guest houses are almost always cheaper. If you’re worried that your kids won’t adapt well to slumming it a bit, don’t be! My boys were 5 star snobs because of Dad’s work, they see no difference in the guest houses we use now. In the USA we find the opposite is true, booking online is the best way to go for family budget travel in the States. Sleeper trains save you 1 night’s hotel bill and are lots of fun. A night train, bus or flight saves you the cost of one night’s accommodation. 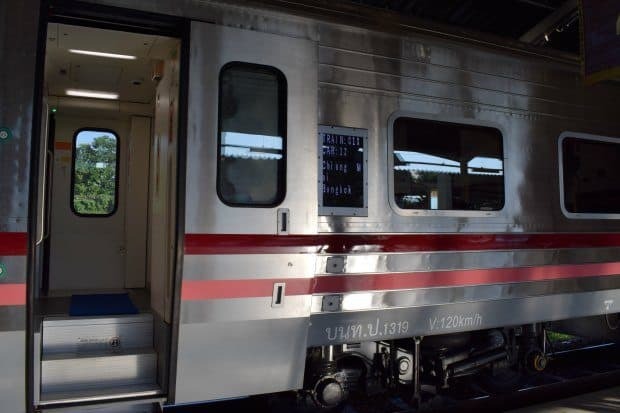 Train travel in Thailand is excellent, we usually sleep really well on night trains, but we’ve had one rough night caused by carriage suspension. Use local transport as much as you can. Avoid tourist buses, taxis and pre-booked tours. You can always get there cheaper yourself. There are exceptions to this rule, sometimes a family will travel cheaper in a taxi than on a bus with 4+ tickets. Research costs thoroughly. Do your research. Find out how much a taxi fare from a to b should be before you enter into negotiations with drivers. Just Google it! Never accept the first price a driver offers you. If you need to book seats on a bus or mini van, try to book 1 seat between 2 small kids, we’ve got away with that sometimes, we all squash up or they sit on laps. Where you can, only use taxi drivers that are willing to use their meters You may have to walk a street or two to avoid the taxi sharks hanging around tourist hot spots, but you’ll save a lot. Avoid bank charges like the plague! Find bank accounts with no charges for cash withdrawals, consider pre-paid travel money cards, search for the best ATMs, exchange currencies at the best rates and always, for card transaction, select the right currency to pay in. There are a multitude of ways to do this, we have a guide post for handling money specific for Thailand, if you read that you’ll be on the right track. 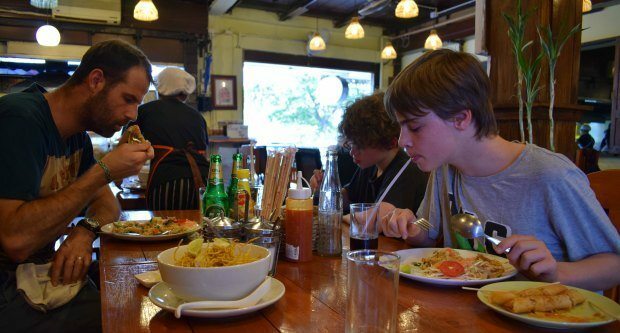 A typical family lunch or dinner, good food, low prices. $1-$2 per head. Buying food from shops and markets is usually cheaper than eating in restaurants and cafés. Look at the “beer index” on menus. Check out the price of a beer in the local shops and use that to gauge how expensive a restaurant will be. Night markets, the ones the locals use, not the tourist ones, have incredibly cheap, good food. Use them as much as you can. Accommodation that includes breakfast can save you money. Check that it’s a proper breakfast, not just toast. Hostels with kitchens or accommodation with simple catering facilities can save you money. Travel with a knife for cutting fruit, a bottle opener for wine or beer, a spoon, fork or bowl for anything else you can buy. A water bottle, cut down to size, makes a great wine glass! and a mug will save you a fortune on coffees. 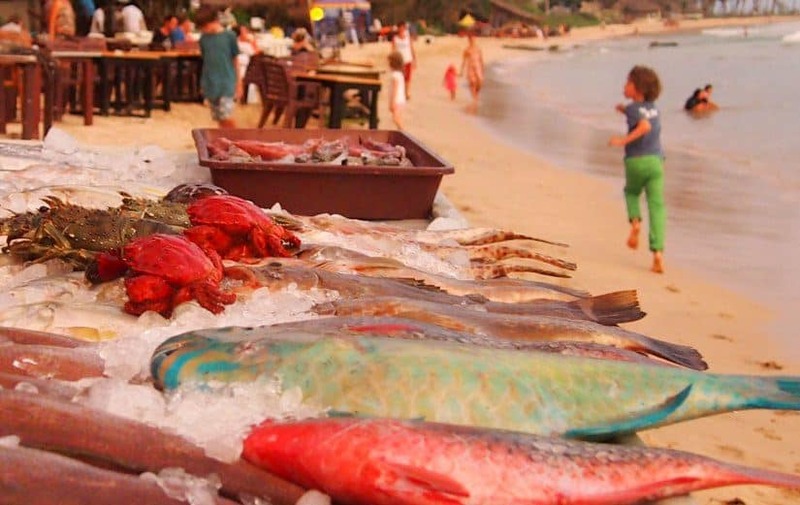 The beachfront restaurant may look lovely, but off the beach you’ll pay less and your money is more likely to go into the local community, where it belongs. If portion sizes are huge, share, or switch to two meals a day. We had huge, delicious breakfasts in Laos, we didn’t need more food until early evening. Find out where the locals eat, ask around. It could be a great street stall. Then hope they don’t have a two-tier pricing system. Don’t Spend Big Before you Leave. Pre-travel costs can add up, think about needs and wants to cut them down to size. Do you need expensive travel clothes? We don’t own any, they’re unnecessary. Do you need a new wardrobe to look cool on the beach? You can buy great stuff locally at better prices and the new people you’ll meet won’t have seen your whole wardrobe before. Best Blog Read Now! 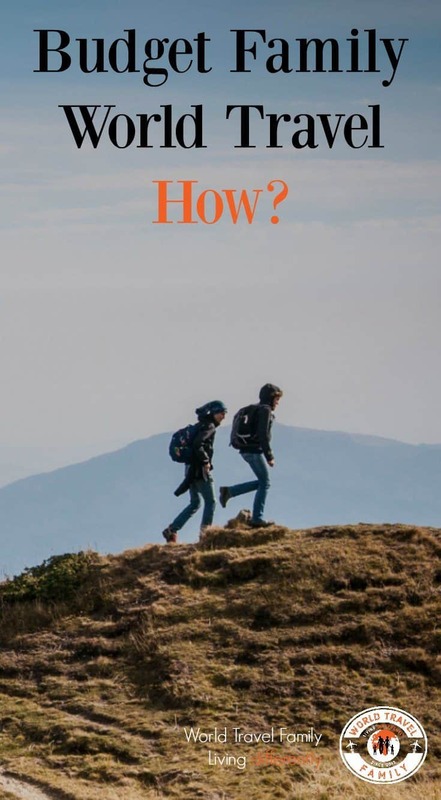 How do Families Afford to Travel the World? Shop around for travel essentials. I got a good deal online on my fantastic new backpack after comparing prices all over the world. If it’s broken can you fix it? You’ll find people capable of repairing or altering backpacks and clothes anywhere in Asia. Slow Travel is Budget Travel. The less often you move, by air, rail or bus, the lower your transportation costs for the trip will be. You will often get a better rate on accommodation if you stay a few more days. That applies to online bookings and face to face enquiries in Asia. The longer you stay put, the better you get to know an area. You have time to find the best, cheapest restaurants or the shops and markets with the cheapest beer or food. Sometimes we’ve based a decision on whether or not to visit a particular country on visa costs. For instance, Visas for Vietnam are expensive and kids pay too, whereas kids visas for Cambodia or Sri Lanka are free. ( don’t get caught at the Cambodian border kids visa scam). Don’t forget to check out little details like this as you go. I say over and over again, don’t become a blogger to get free stuff. The marketing departments of big hotels and attractions know exactly what you’re doing and you just look stupid. Before you apply for press passes and hotel promotions, know that you have something to offer, be good at what you do and be committed. In our first year of travel we had multiple press passes to big attractions and a couple of free or discounted hotel stays. The blog was already a year old when we left home and it was doing well. You won’t get this stuff straight from day 1 but you don’t necessarily need huge figures. A day at a theme park can make a trip for your kids, if you can get it free and can market it well through your website and social media presence, go for it. Just be prepared to put in the work and do a great job. At the end of the day we all travel for enjoyment. Don’t beat yourself up over spending a bit more occasionally. Spoil the kids with a fancy dessert every now and again, enjoy a cocktail on the beach if you want one. We like to get as much travel as we can for our dollar but if we go over budget, so what? We can make more money later, but we’ll never have this time with the kids again. What do you think? Any budget family travel tips you’d like to share? We’ve moved on from Asia now, we’ve taken family budget travel to the UK and USA, it’s a totally different ball game, but we’re picking up some budget tips for the Western Hemisphere too. These will all have their own posts in time. Which flight booking websites give you the best deals. What is the most expensive part of a US road trip. Ideas for New York on a budget. How can a cruise be ( almost) budget travel. How to Save Money on Flights with Skyscanner - But Should You? 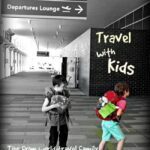 Travel With Kids Blog-Not Again!